There must be a sea of hair styling products on the market, which might make you overwhelmed and confused a little bit. However, if you spend some time learning about each kind of hair product, it will be much easier. 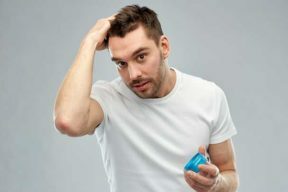 One of the most popular hair styling products for men is pomade, which suits the best for short hair based on its ability to hold hair in place as well as how long it lasts. 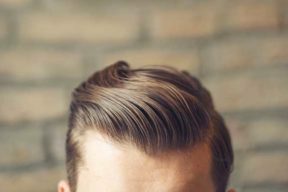 In this article, we will share with you the best pomade for men and also classify them based on many targets. 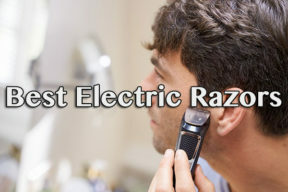 For examples, how well you know about this kind of hair product or the preference of barbers. I. What is pomade? How does it work? To choose and even to use pomade in the best way, first of all, you should learn something about it. If you once see it, you will find it’s quite the same as wax. An explanation for this is that pomade is actually wax added with some more features. About the texture, most pomades are waxy and to get it in work, you need to use both palms and rub them together to make heat. When applying it to your hair, you will realize that its shine degree is quite different from other hair styling products, not as shiny as gel and spray but just an elegant and light shine, making your hair a natural look. In turn, a common problem of pomade is that it’s washed out not as easily as wax or gel. You need to use specific shampoo or soap, otherwise, your hair will have some stains or stay sticky. Hair falling down, hair back to original shape, hairstyle easily to fail under some outer effects, etc. Stay away from those products that cause any of the problems I have just mentioned. You have spent money on a hair styling product, don’t pick the useless. Apart from good holds, you should consider its ability to keep your hairstyle. This feature usually depends on your purpose. Like if you want a pomade to use for desk-office life, just pick a product that can keep your hand stay in place for at least 8 hours. Or if you want to use it to hang out with friend or take part in some activities, go for a stronger pomade. Another choice is to choose a medium last pomade but it must be easy to touch up when in need. 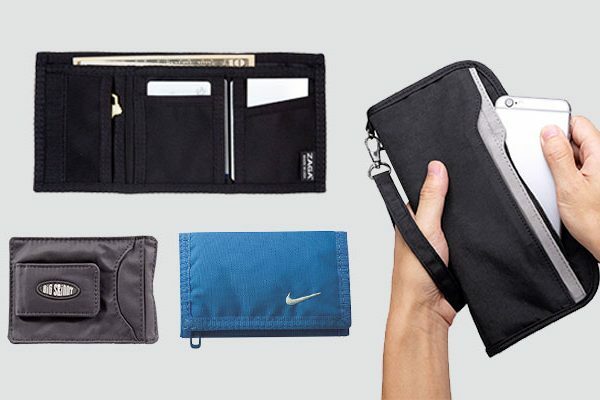 Besides, you should consider the hardness of the product, as well. As I mentioned above, most pomades need specific soaps or shampoo to cleanse completely without leaving any stains. However, there are still some that don’t. They are very easy to wash out with water and nothing left on your hair. Besides, it is better if you can pick a pomade that can make your hair look beautiful and flexible again after wash. Some pomades run a lot when you use them. They are even sticky, which is rather uncomfortable at all. I mean sometimes I get drunk or too tired to go to bed without taking a shower, in such cases, I need a pomade that doesn’t leave stains or ruin my pillow. If you are sensitive to smell, consider this feature carefully as some products may have strong and overpowering smell. Nowadays, the trend is about something natural or made of natural ingredients, which must be heathy complete to human beings. And it doesn’t except for pomade. 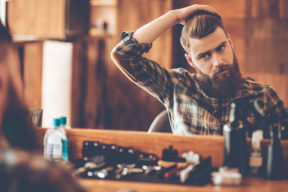 Moreover, if you have thin and weak hair, this feature is even more important as toxic chemicals in pomade might cause harm to your scalp and health. 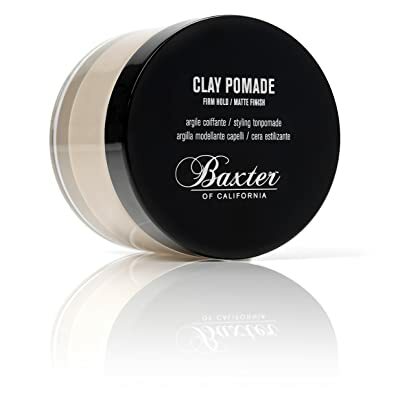 Baxter of California Clay Pomade provides kinds: single unit and kit including a recharge cream, a deodorant, a clay pomade, a hard-cream pomade, a vitamin cleansing bar, an exfoliating body bar, a shampoo, a face wash, a moisture, a shave formula and an after-shave balm. 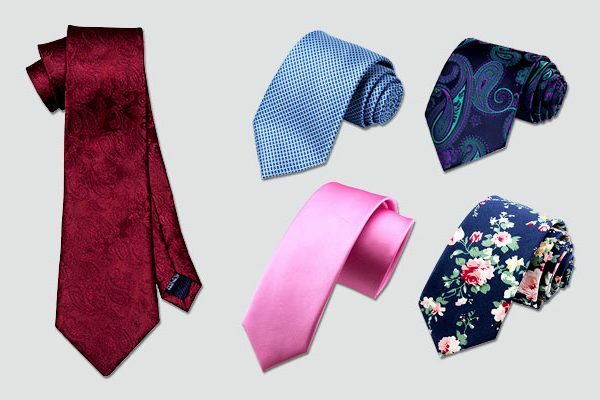 The manufacturer is quite thoughtful to give us two selections so that we can pick the most suitable one meeting our need. Talking about the pomade, the outer shell is made of high-quality glass, giving luxury and cool look. About the quality, this pomade does a good job to hold hair in place, even thick wave or curly hair, lasting all day if I just go to work. But when I hang out with friends, party, dancing and other activities, to keep my hair in place, just use my hands. I have heard a lot of its smell. People said that it’s strong and uncomfortable but I myself think this smells like licorice and is acceptable. But it doesn’t a serious matter, this is a pomade to go for. A little bit expensive, but I think it’s worth it. When it comes to pomade, the very first thing I consider is how hard it will be. 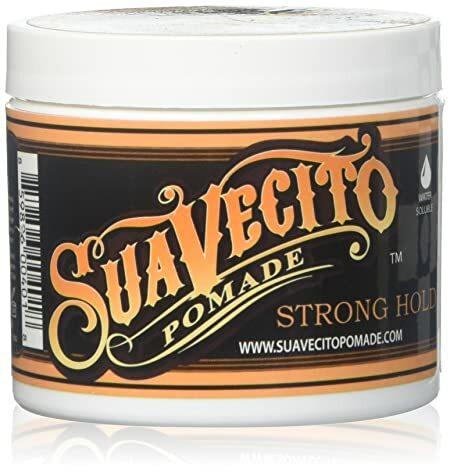 With this Suavecito Pomade, my concern is eased with medium hardness with no crunchy finish, which I’m very pleased. And it works great for both long and short hair. Like the Baxter, this one keeps my hair style last for entire day. And if I want to touch my hair up, just add a bit water to reactive with my hands, that’s it! But the highlight feature is its water-soluble ability. I can grip my hair like and comb without white residue like I using wax, but it is also easy to wash out like when I use gel. 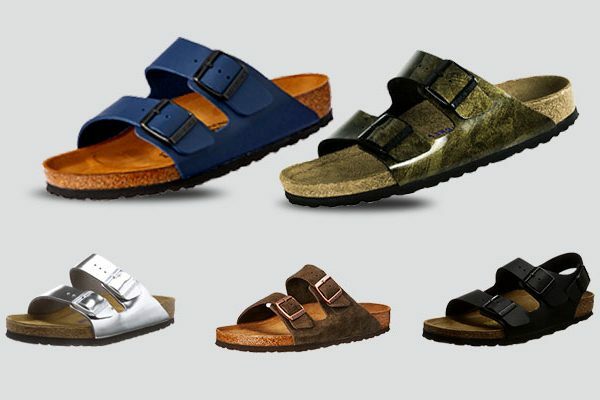 This is a convenient item for men. The product is quickly dried after applying but I still enable to style my hair easily. Another thing I care about pomade is its smell. Some arrives in strong and even bad smell but this product soothes my mind as it comes with fresh, clean smell. I recommend this product when you need a multifunction pomade as it can work well on modern, classic, retro and even old school hair styles in addition to a moderate shine to give a perfect look whether it’s night or day. Plus, this product can keep your hair last all day. One small feature is its design, very cool and impressive. The smell is a little strong for those who are sensitive to smell. 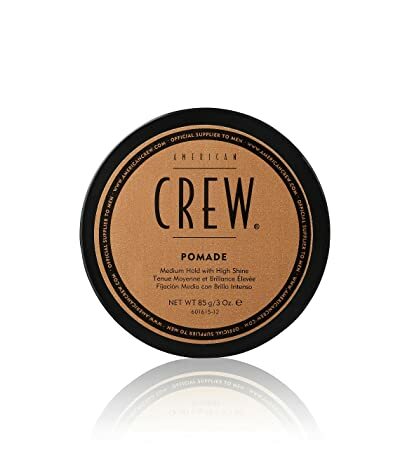 The most impressive feature about American Crew Pomade is its super natural ingredients, which is friendly to hair, especially for those who have thin and weak hair. Besides, unlike two pomades above, the smell of this one ease my mind as it’s very natural. You hardly smell any synthetic additives while using it. Talking the ability to hold hair, this is another great product. It doesn’t take much effort to style hair, keep it stay in place all day long and easily touch up when in need. However, in comparison with two pomades above, I think the ability to hold hair of this one is not as great as them. However, with American Crew pomade, I can do almost hairstyles with this pomade without any difficulties. An advisable item for men! 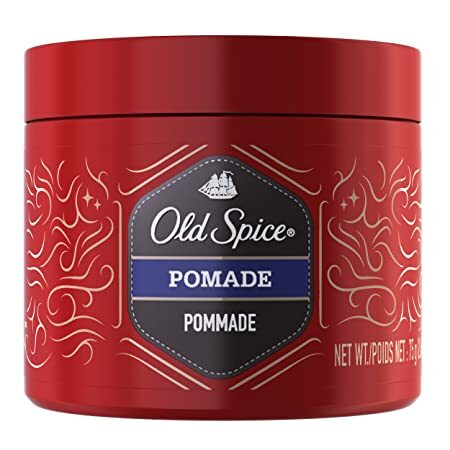 I found a small tip to style my hair more easily with this pomade is applying the product when your hair has some moisture, like after taking a shower. After it is dried a bit, just comb it out. If you worry that it will be crusty or hard after washed, feel ease in mind as this one is quite easy to wash out. And don’t fret about its shining as well as this product releases a moderate shine, which is even perfect if you have curly hair as it will pop your hairstyle up more. 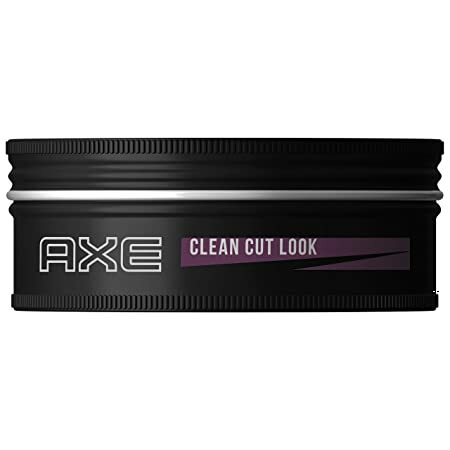 For those guys who are finding a specific pomade for a particular hairstyle, go for this AXE. 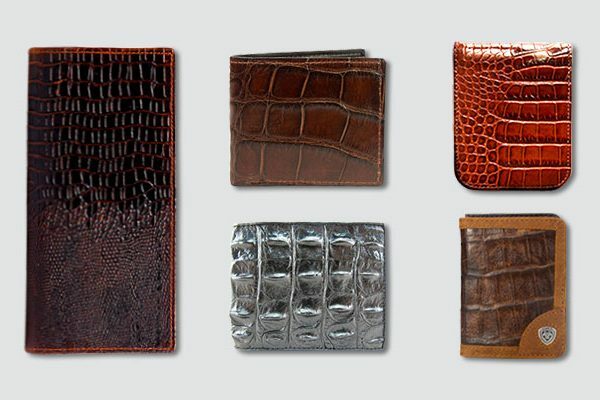 They come in 6 styles to meet many requirements and preference including natural look with great softness, natural look with understated, smooth look with gross shine, clean cut look for classic style, messy look with good flexibility and spiked up look. Like the American Crew pomade, the ingredients of this product are natural and friendly with shea butter and natural almond. Also, that feature is a big thank you for your hair as when washing, it is easy to be cleansed out, making your hair beautiful and well nourished. Besides, these natural ingredients help to add moisture to your hair, make it soft and look healthy with stunningly smooth. Last but not least, the smell, very comfortable and elegant. Unlike four pomades above, this one arrives in a garish design, red. If you prefer an unmistakable pomade which is easily recognized, this is an ideal choice. Like the Baxter, Old Spice Spiffy Mens doesn’t end up with crunchy finish but the matter. Thus, you need to touch your hair up a few times if joining a party or hang out with friends. In turns, it creates a clean-cut look, which is cool, smooth and polished. They dry quickly on my hair but still easy to style, just about 5-7 minutes, which is a little bit faster than its competitors. In my opinion, this pomade works better with short hair than long hair. In comparison, it has more reasonable price than Suavecito but you get what you pay for. Old Spice Spiffy Pomade has moderate hold. I mean they last long, but not for entire day as Suavecito or Baxter. Besides, it takes more product just to do the same effects on my hair, comparing to the others. As the light texture, it doesn’t come up with strong hardness on hair, but a gentle and really natural hair. After washing out, it doesn’t leave any sticky feeling at all and comes off very easily. Even if you go to sleep with your hair full of Old Spice Spiffy Pomade, don’t fret, it won’t ruin your pillow at all. In terms of the smell, I must say, this is the best smell ever I have experienced, very good and comfortable. Not too strong, not too empowering and last all day. 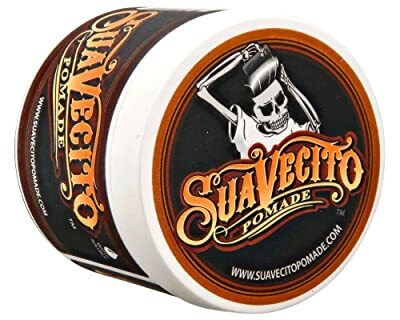 As I expected, this Suavecito Pomade comes with strong hold and last really, really long, which might absolutely be its strong point that no competitors can beat up. Thus, I think this product is perfect for side parts, slick backs and pompadours. Furthermore, you can do any hairstyles by this pomade. Like the previous Suavecito, this one also has good water-soluble ability, which is very easy to cleanse out without any specific soaps or shampoo and something especially is that it doesn’t leave any stains or greasy after wash, but just a clean and heathy feeling. The highlight is that it has no harsh chemicals to cause harm to both your heath and hair, very friendly and natural. 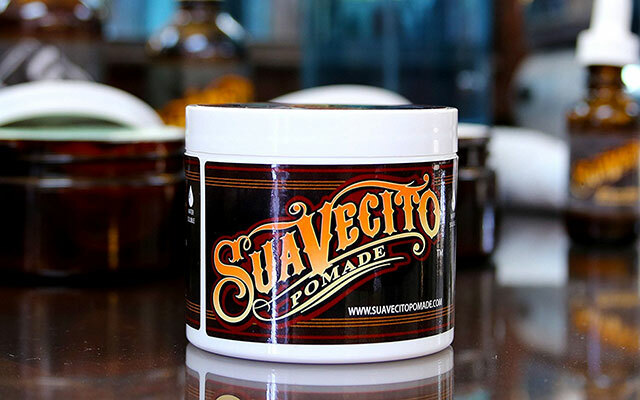 Moreover, if you try Suavecito pomade, enjoy its easiness to comb and style your hair with no frustration or scruffy mess. Again, the shine released from this pomade is quite moderate. A tip is that if you want gross shine hair, just apply it when your hair is damp and vice versa. Last but not least, don’t worry about the quality, it is made from USA. 7. 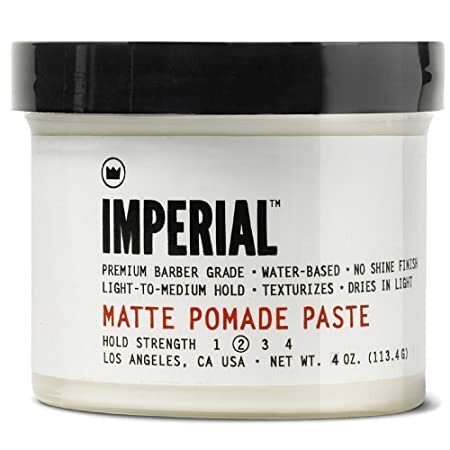 Imperial Barber Grade Products Matte Pomade Paste 4 Oz. If you don’t like the hardness of Suavecito or the shiny look either, this is a go-to pomade. Imperial Barber Pomade will give you a versatile look and matter finish as it has light texture so that when your hair is dried with this product, it won’t weigh your hair down. Based on its ability to hold hair and shiny level, I recommend this pomade for businessmen or entrepreneurs. It goes on easily and easy to do a groomed business style for hair. I usually apply it when my hair is still wet and then use fingers to break the gloss up. Besides, it is very easy to wash out without stains at all. I have heard that the ingredients of this pomade are quite friendly to hair and even also add moisture and help your hair grow thicker and heathier. I myself still don’t feel these effects, but the adding moisture ability. Hair becomes smoother amazingly. 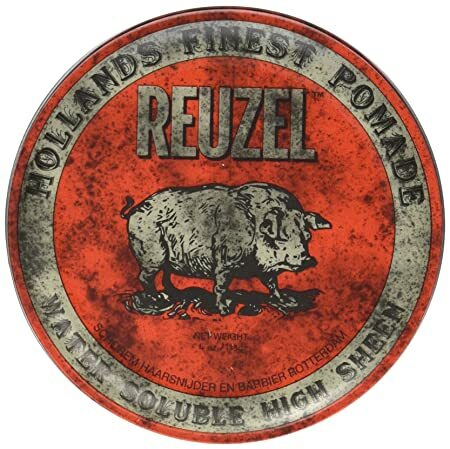 The design of this Reuzel hair pomade attracts me at the very first sight. Contain 4oz and the price is reasonable so that I brought it home. First impression is its really, really great to hold hair. If Suavecito is the best for hair holding, Reuzel will be right after. And it holds even stronger if I apply it in dried hair, very suitable for those days hanging out with friends or taking part in outdoor activities. But the highlight is that it is waterproof so that even you get sweat, don’t worry about your hair will be loosen. Besides, it holds my hairstyle all day long. Talking about the shine, this pomade is a versatile water based product, which means you can control the degree of shine based on your particular requirement or preference. For gloss look, just apply more water and vice versa. On the other hand, it is easily to do hairstyle, you can use comb, blush or just your fingers to make your hair into the wanted style. And it will stay in place all day. Above is my selected collection for the best pomade for men. 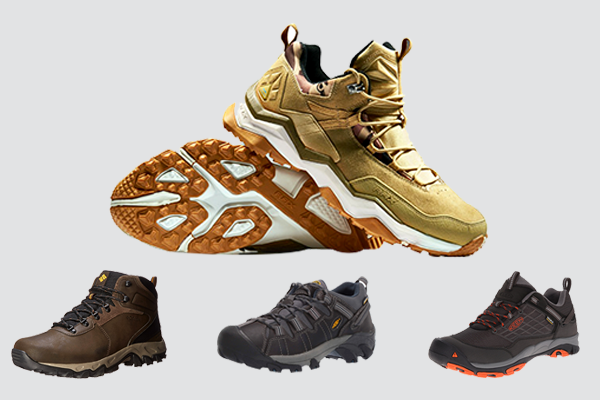 Hope that through this article, you can find out the right one to suit your needs and preference the most.